The impact of immigration on American economic development has become one of the most controversial issues in recent policy debates. While much of the economics literature shows the positive contribution of high-skilled immigrants to US inventive activity for recent time periods (e.g. Hunt and Gauthier-Loiselle 2010, Kerr and Lincoln 2010), there is little systematic evidence establishing their contribution over the longer run (Abramitsky and Boustan 2016). Our new study attempts to inform this debate by examining the role of immigrant inventors in the process of technological development from an historical perspective (Akcigit et al. 2017a). The channel through which immigrant inventors can contribute to growth can be understood with reference to at least two literatures. First, endogenous growth theory assumes that innovation and technological progress are main engines of long-run economic growth (e.g. Romer 1990, Aghion and Howitt 1992). Second, a vast literature shows that human capital accumulation is a major determinant of growth (e.g. Lucas 2009, Gennaioli et al. 2012). Since high-skilled immigrant inventors bring advanced, or ‘upper-tail’ human capital (e.g. Mokyr 2002, Squicciarini and Voigtländer, 2015) to the host country, they can have a large impact on technology diffusion and productivity growth. Our study is part of a major project linking millions of individuals from Federal Censuses between 1880 and 1940 to millions of inventors from patent records (Akcigit et al. 2017b). Since the Federal Censuses report birthplace, we can distinguish migrant inventors from those who were US born. Furthermore, the 1940 Census asked respondents how much they earned in 1939. This information permits analysis of the relative differences in labour income between immigrant inventors and their domestic-born counterparts. Our time period includes the age of mass migration between 1850 and 1913, when almost 30 million European immigrants came to America, and years under the national origins quota system, which limited entry by immigrants between the 1920s and the mid-1960s. In our data immigrants accounted for 19.6% of all inventors between 1880 and 1940. Today, that share is about 30%. Figure 1 shows the share of inventors who were born abroad in each state. During the late nineteenth and early twentieth centuries, economic activity was largely concentrated in parts of the Northeast and the Midwest (Glaeser 2011). Immigrant inventors were heavily concentrated in these places too, perhaps in response to the greater opportunities and rewards available to individuals with inventive capabilities. Indeed, prior work has shown that the movement of inventors across countries is affected by key economic variables that affect financial returns, such as tax policy (Akcigit et al. 2016). Meanwhile, immigrant inventors were far less represented in southern states, where opportunities, or societal openness to disruptive ideas, may have been more limited (e.g. Acemoglu et al. 2014). Notes: Map shows the share of each states inventors who were born abroad in our six decennial census years (1880, 1900-1940). Darker colours indicate a higher immigrant share. Based on an analysis of US patent technology classes, Figure 2 shows the areas in which immigrant inventors were prevalent. Medical inventions (e.g. surgical sutures) accounted for the largest share of immigrants, but this category produced just 1% of all US patents. However, immigrants were also active in chemicals and electricity – two sectors that had a particularly large effect on US economic growth, accounting for 13.9% and 12.6% of all US patents, respectively. Noticeably, immigrants accounted for at least 16% of patents in every area. This evidence suggests that their impact on inventive activity was widespread. 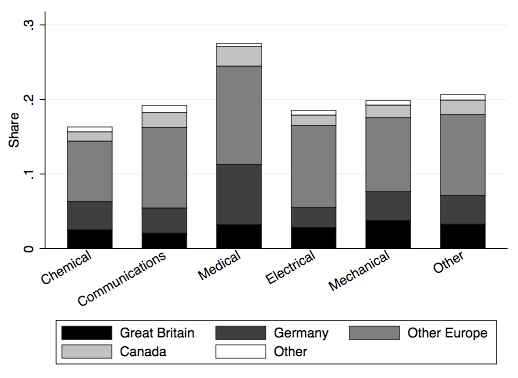 Figure 2 also shows that the majority of immigrant inventors originated from European countries, with Germans playing a particularly prominent role. This is consistent with the findings of Moser et al. (2014) who show that German-Jewish émigrés who fled the Nazi regime boosted innovation in the US chemicals industry by around 30%. Today the closest analogue to these high-impact individuals would be inventors of Indian and Chinese ethnic origin who make substantial contributions to the development of innovation clusters in areas like Silicon Valley (Hunt and Gauthier-Loiselle 2010, Kerr and Lincoln 2010). Notes: Figure shows the share of inventors who were born abroad in our six decennial census years (1880, 1900-1940), broken down by main technology area. Our study attempts to measure the extent to which immigrant inventors were associated with long-run US technological development. We constructed a measure of foreign-born expertise, which multiplies the share of each country’s patents granted in a given technology area between 1880 and 1940 (as a measure of proficiency) by the number of immigrants from that country in the 1940 Census (as a measure of how intensely that proficiency diffuses to the host country). We find that technology areas with higher levels of foreign-born expertise experienced much faster patent growth between 1940 and 2000, in terms of both quality and quantity, than otherwise equivalent technology areas. Although we do not identify a causal relationship, our quantitative evidence can be used alongside qualitative evidence to highlight two areas where immigrant inventors may have acted as catalysts to economic growth: through their own inventive activity and through externalities affecting domestic inventors. Immigrant inventors were responsible for some of the most fundamental technologies in the history of US innovation, which still influence our lives today. For example, Nikola Tesla, who was born in Serbia, worked in America on alternating current electrical systems; the Scotsman Alexander Graham Bell was instrumental to the development of the telephone from a workshop in Boston; Swedish inventor David Lindquist, while living in Yonkers, New York, assigned his patents relating to the electric elevator to the Otis Elevator Company located in Jersey City, New Jersey; and Herman Frasch, a German-born chemist, worked in Philadelphia and Cleveland on techniques which are analogous to modern fracking. The positive externalities of migrant inventors can be observed through their collaborations with domestic inventors. The specialised insights brought by migrant inventors most directly augmented the skills of domestic inventors through team-based production. For example, the 1940s saw James Hillier, a Canadian immigrant, develop the first commercially viable electron microscope at Radio Corporation of America alongside Ladislaus Marton, a Belgian inventor, Vladimir Zworykin, a Russian inventor, and US-born engineers. However, it is important to note that we cannot rule out that immigrant inventors may have displaced domestic born engineers. For example, Borjas and Dorn (2012) found that the arrival of Soviet mathematicians in America during the 1990s led to the marginalisation of US mathematicians. Our study also shows that the assimilation of foreign-born inventors into the US was not frictionless. Using data on labour income from the 1940 Federal Census, we show that, despite being more productive in terms of patenting, immigrants were paid less on average than domestic inventors. There is also evidence of similar wage penalties for other potentially marginalized groups – specifically black and female inventors. These results are consistent with classic definitions of discrimination going back to the work of Arrow (1973), where differences in wage income are attributed to discrimination if they cannot be explained by differences in productivity. In summary, our study – which is based on a large new data set matching millions of inventors from patent records to individuals in Federal Censuses – provides suggestive evidence that immigrant inventors were of central importance to American innovation during the 19th and 20th centuries. Although the migration of high-skilled inventors to the US involved some costs, immigrant inventors contributed heavily to new idea creation, through both their own work and collaboration with domestic inventors. Our evidence aligns with the view that growth in an economy is determined by its ablest innovators, regardless of national origin. The movement of high-skilled individuals across national borders therefore appears to have aided the development of the United States as an innovation hub. Abramitzky, R and L Platt Boustan (2016), “Immigration in American Economic History,” NBER Working Paper 21882. Acemoglu, D, Ufuk Akcigit, and M Alp Celik (2014), “Young, Restless and Creative: Openness to Disruption U Creative Innovations”, NBER Working Paper 19894. Akcigit, U, S Baslandze, and S Stantcheva (2016), “Taxation and the International Migration of Inventors,” American Economic Review 106 (10), 2930–2981. Akcigit, U, J Grigsby and T Nicholas (2017a), “Immigration and the Rise of American Ingenuity”, NBER Working Paper 23137. Akcigit, U, J Grigsby and T Nicholas (2017b), “The Rise of American Ingenuity: Innovation and Inventors of the Golden Age”, NBER Working Paper 23047. Aghion, P and P Howitt (1992), “A Model of Growth through Creative Destruction,” Econometrica 60 (2), 323–351. Arrow, K J (1973), “The Theory of Discrimination”, in O Ashenfelter, and A Rees (eds. ), Discrimination in Labor Markets. Princeton University Press, 3–33. Borjas, G J and K B Doran, “The Collapse of the Soviet Union and the Productivity of American Mathematicians,” Quarterly Journal of Economics 2012, 127 (3), 1143–1203. Gennaioli, N, R La Porta, F Lopez-de-Silanes and A Shleifer (2013), “Human Capital and Regional Development” Quarterly Journal of Economics 128 (1), 105-164. Glaeser, E (2011), Triumph of the City: How Our Greatest Invention Makes Us Richer, Smarter, Greener, Healthier, and Happier, Penguin. Hunt, J and M Gauthier-Loiselle (2010), “How Much Does Immigration Boost Innovation?,” American Economic Journal: Macroeconomics 2(2), 31–56. Kerr, W R and W F Lincoln (2010), “The Supply Side of Innovation: H-1B Visa Reforms and US Ethnic Invention,” Journal of Labor Economics 28(3), 473–508. Lucas, R E (2009), “Ideas and Growth,” Economica 76(301), 1–19. Mokyr, J (2002), The Gifts of Athena: Historical Origins of the Knowledge Economy. Princeton University Press. Moser, P, A Voena, and F Waldinger (2014), “German-Jewish Emigres and US Invention,” American Economic Review 104(10), 3222–55. Romer, P M (1990), “Endogenous Technological Change,” Journal of Political Economy 98(5), S71–102. Squicciarini, M P and N Voigtlaender (2015), “Human Capital and Industrialization: Evidence from the Age of Enlightenment,” Quarterly Journal of Economics 130(4), 1825–1883.